On clear days, it is not unusual for the Navy’s Blue Angel fighter jets to zoom over Jon Lazarcik’s eighth-grade science class at John F. Kennedy Middle School in California’s Imperial Valley. Located along the U.S.-Mexico border 120 miles east of San Diego, rural, mostly Hispanic Imperial County has the highest poverty rate in the state. The roaring jets often distract students in this traditionally low-performing school. But the students in Lazarcik’s class are engrossed in an innovative science-education program employed by some of the nation’s most prosperous schools. On any given day, students can be found using prepackaged science experiment kits to test soil samples, germinate seeds, model local wind patterns or observe the phases of the moon. "Motivation to learn is half the battle," says Lazarcik. "And our students come to science motivated and energized because they know they will be learning actively and not listening to a boring lecture." Based on the philosophy that children learn science by doing it, not by reading about it in textbooks, the Valle Imperial Project in Science uses what teachers call "inquiry-based" learning. Lazarcik and his colleagues serve as guides, helping their students discover science through experimentation, and challenging them to record and analyze data in journals. Inquiry-based teaching has boosted learning in more than science among the 22,500 students in the 14 Imperial Valley school districts served by the project. On the Stanford 9 Achievement Tests, fourth- and sixth-graders who received inquiry-based science instruction for four years scored better in math, reading and writing, on average, than students who didn’t receive it. "What is most encouraging is the progress we have seen in our English-learning population," says Dr. Michael Klentschy, the project’s mastermind. 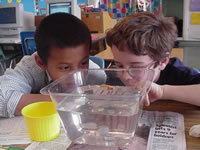 "Inquiry-based science has given them an invaluable head start." But now, the program’s federal funding is in danger of drying up. Thanks to President Bush’s No Child Left Behind education initiative — the most extensive federal overhaul of public schools since the 1960s — the National Science Foundation, which funded the project, could lose $140 million next year. Without that money, the agency’s ability to jump-start innovative science programs in rural schools may soon be a thing of the past. When Bush entered office in 2001, pledging to eliminate "the soft bigotry of low expectations" in public education, he imposed what has been criticized as a "one-size-fits-all" approach that limits the depth of instruction local schools can provide. One of his first moves was to eliminate the National Science Foundation’s Systemic Change Initiatives that funded the science program in the Imperial Valley. In its place, he created a $1 billion Math and Science Partnership program that teams up university scientists and local educators, with the goal of strengthening curricula and improving test scores. These partnerships are intended to serve as models that can be replicated in schools across the country. But in his proposed budget for this year, the president eliminates funding for the National Science Foundation partnerships altogether. Administration officials say it’s necessary because the foundation’s partnerships are not specific enough to No Child Left Behind. If Congress approves the president’s plan, the $269 million partnership program will be moved to the Education Department, where things will be very different. The National Science Foundation is an independent agency that awards competitive grants through a stringent peer-review process. But under the Education Department, the president’s political appointees would make all the decisions on grants, according to Jodi Peterson, the director of legislative affairs for the National Science Teachers’ Association. Peterson says that the change would almost guarantee that science would get short shrift; research would focus almost entirely on basic high school math. The proposed move is a drastic step for a president whose party called for the abolition of the Education Department just a decade ago. Critics charge that the administration wants to set the research agenda for how math and science are taught (HCN, 6/23/03: Sound Science goes sour). Even as criticism mounts against Bush for his selective use of science in other policy matters, No Child Left Behind may leave real classroom science behind. Dr. Olga Amaral, director of Teacher Education at San Diego State University — who has worked on the Imperial Valley’s science project — worries that No Child Left Behind will put classroom priorities in the hands of a small group of bureaucrats and limit the scope of curricula from which local schools can choose. "It is nearly impossible to make a case that (teaching techniques that work) in one classroom are so solid that they cannot be torn apart when applied to a different school, in another state, with children from a different socio-economic background," Amaral says. The people behind the Valle Imperial Project in Science know the pitfalls of federal research mandates firsthand. Despite two published papers, national recognition for the project’s success and positive peer reviews, the National Science Foundation recently denied their proposal for what may be one of the final competitive Math and Science Partnerships. The agency said there wasn’t enough research to show that inquiry-based instruction could be replicated in other schools. Program director Klentschy politely disagrees, but maintains his faith in the agency that got the project going in the first place. However, he has developed a new mantra for finding funding in the age of No Child Left Behind: "In God we trust. Everybody else bring your data." Klentschy says his funding is running dangerously low. Layoffs and pay cuts seem imminent and two poorer Imperial Valley school districts have been forced to drop the program. But he and his teachers are still fighting to improve education, taking heart in their research, and in classroom evidence that can’t be quantified. San Diego State researcher Amaral remembers observing a class that was asked to write three complete-sentence observations about soil in their science notebook after completing a series of experiments. "A quiet boy raised his hand and urgently asked if he had more than three, could he write those down, too," Amaral recalls. "You can compile all the data in the world, but every time I see a child’s interest sparked like that, it makes a believer out of me all over again."